Hadeer Abaya – Black Abaya butterfly – Egypt Abaya| Very Beautiful Black Abaya Butterfly with fashionable Embroidery on Bust and Sleeves . Very appealing floral green, Gold or red embroidery Abaya can give you a different look from others. The Butterfly Abaya is made of comfortable chiffon material. It presents a multi-colored combination (green, black ,red and Gold) floor length embroidery work in a column along the middle of the dress. This gorgeous product can match perfectly with your choice. The Butterfly Abaya is supplied with the same embroidery and material scarf which can give complete satisfaction when going outside or being present at a party. This amazing product is available in Free size. 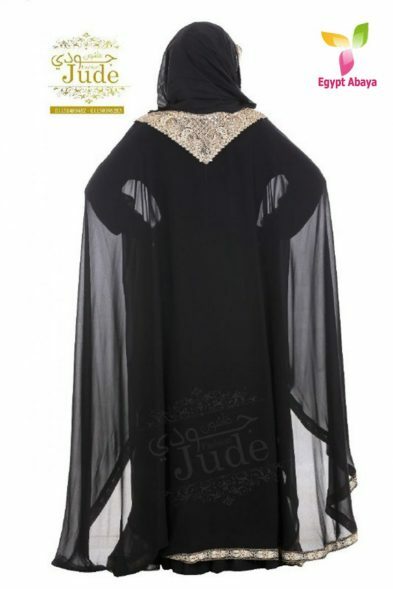 Moreover, it is machine washable; you will love the Abaya for daily or occasional use.